Normally I am not here today, but today was special and you can read the lower post below... I am guest hosting and I am bragging. Now I know I am a nerd, so go ahead and call me a nerd... NERD. 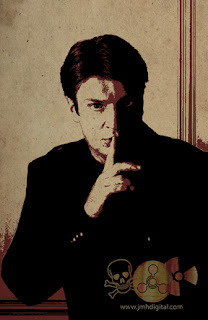 I am using a photo from the new season of Castle, which is sort of cool. Shhh Saturday is true. I worked at home today. Haven't said a single word all day. You're not a nerd. Geek maybe, but that's cool.